George Clark and his wife, Mary Crane Clark, both of Irish descent, came to the United States from Scotland in July, 1850. Along with their sons Thomas, John and George, they traveled directly to Wisconsin and settled in Menomonee Township where a small Irish farming enclave had developed. After boarding with his brothers, who had emigrated to the United States in 1843, and working on the Lisbon Plank Road, George Clark acquired a 40-acre farm and lived in what was probably a log cabin where the Clarke House now stands. George pursued the life of a farmer until his untimely death from blood poisoning in 1863. His wife, Mary, continued to manage the small family farm while raising her three teenage sons. The Clarke House is quite possibly the oldest house in the Village of Butler. It originally stood on the east side of 124th street in the Town of Wauwatosa, about two blocks south of Hampton Avenue. while it is difficult to pinpoint the construction date of rural farmhouses, it is likely that the modest greek revival farmhouse, the core of the present Clarke House, was built between 1849 and 1856 by Simeon Barnes of New York State. Barnes later sold the property to the Van Nortwick’s. In 1870 the three Clarke sons purchased the Wauwatosa farm from the Van Nortwick’s as an investment and to provide a better livelihood for their mother. subsequently, the Clarke sons left the farm – Thomas, the eldest, first became a school teacher before switching careers to become a sales representative. John, became a lawyer, and ultimately a district attorney in Milwaukee. George worked as a deputy sheriff in Milwaukee. In 1894, George moved in with his brother, John, and his wife, Anna – and it was then that George was introduced to Anna’s friend, Jennie Kelley of Stockbridge, Wisconsin. George, at the age of 47, and Jennie, 29, were married in Kaukauna in 1896. Less than three months before George’s mother, Mary, died, she had relinquished her lease of the farm on 124th Street to George. 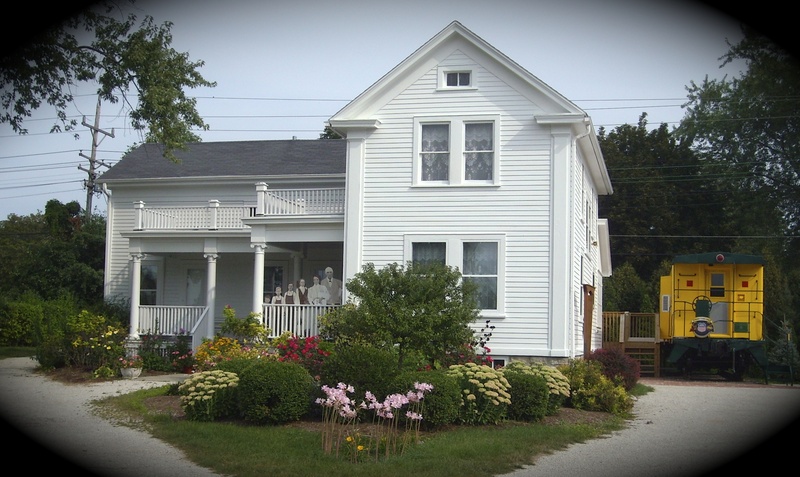 George and his new wife, Jennie, left Milwaukee to reside on the farm and moved into the old Barnes house. Their first child, Agnes, was born there in July, 1897. They eventually had seven more children, five of which survived infancy. They were John, Francis, George, Jean and Thomas. The Clarke’s pursued the life of a farm family until September, 1909 when they sold the west 45 acres to the Milwaukee, Sparta & Northwestern Railway, a division of the Chicago & Northwestern Railway. The railroad quickly constructed a major railroad and repair facility on farmland purchased from George and other farmers in the area. As a part of the sale, George and Jennie Clarke reserved the right to move their house off the land before March of 1910. They subsequently hauled the old Barnes house on rollers, pulled by mules, across the fields to its present site on the 40-acre ancestral farm. After the house was moved, a builder was contracted to enlarge and modernize it. The result is the present structure. A new East Wing was built, all the windows were replaced, a large L-shaped porch was constructed and some of the interior was updated, most notably the central living/dining room. Because the 40-acre farm was too small to support his family, George purchased additional land adjacent to the North of his parcel to increase his holdings to about 76 acres. George continued as a farmer until about 1930. By this time, his children were working at other occupations including his eldest son, John, who worked for the railroad. George died in 1934 leaving his widow, Jennie, and his son, John, living in the house. in the 1950’s, John and Jennie Clarke sold most of the farm for subdivision development, reserving only the present parcel for themselves. Jennie died in 1960 at the age of 93, and her son, John, who never married, died in November, 1992, just a few days before his 94th birthday, having lived his entire life in the house. After John’s death, the Clarke family donated the house to the Village of Butler, and the Butler Community Foundation was formed to restore and preserve it. It is now a Local History and Railroad Museum. The house is open for tours on the second Sunday, May through October (with the exception of Fathers Day) from 1:00-4:00 P.M. Admission is free, and donations are gratefully accepted. To celebrate the Village’s Centennial in 2013, the Butler Community Foundation restored a Chicago & Northwestern Railroad Caboose that stands on the east side of the house and is included in the tours. For further information, please contact Marilyn Schultz at 262-783-4188.